Honour thy father and thy mother: that thy days may be long upon the land which the LORD thy God giveth thee. Exodus 20:12, KJV. The Hebrew and Greek interpretation of the word honour have several different meanings. In Hebrew the word is translated to mean magnificence, splendor, to be rich and glorious. In Greek the word is translated to mean to revere, esteem or nobility. Father’s of today, you are celebrated as men who have been created in the image and likeness of God (Genesis 1:26, NKJV) and are to be revered and esteemed with nobility as the ordained leaders of your households as Christ is the head of the church (Ephesians 5:23, NKJV). What an incredible responsibility and gift! It is no mistake that God wants every man to exemplify the characteristics of Himself in the life of every man. As children, today we should give honor and richly esteem the man who has created us in his image and likeness. Honor your father, here on earth and in Heaven, with such love and respect that nothing else in the world could compare to such a gift. The love, honor and respect that is shown to the father of our own individual families, should be the same that is shown to the Father of all creation. To honor him in such a way, is priceless. If we daily love the Lord our God with all our heart, with all our soul, with all of our mind (Matthew 22:37, NKJV), I cannot think of a greater honor to give to my father this Father’s Day, than to exercise this principle which Jesus taught, on a daily basis. For Jesus said, “If you love Me, keep My commandments (John 14:15, NKJV). 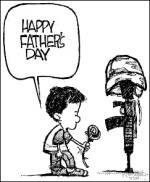 In Honor of my father and to every man who is a father, Happy Father’s Day. Scripture taken from the King James Version has no copyright and is available by public domain. Strong L.L.D., S.T.D., J. (1996). The new strong’s complete dictionary of bible words. Tennessee. Thomas Nelson Publishers. That was well worded, I must admit. I liked how you linked it in to the "Father" of all of us. Beautiful stuff. I appreciate it. Thank you for the Father's Day blog. You're a great brother in Christ. God bless you. Thank you my brother. God bless.